The SEDEX Model 100LT Low-Temperature Evaporative Light-Scattering Detection for conventional HPLC, U-HPLC and SFC allows for the detection of essentially all compounds: detection is based on a universal property of all analytes and does not require the presence of a chromophoric group, electroactive group, etc. The SEDEX Model 100LT combines the highest sensitivity, reliability and accuracy for your analyses compared to all other aerosol-based detectors, thanks to unrivalled SEDERE low-temperature technology. This detector presents a number of outstanding innovations thereby providing the best optical and electronic benefits at a reasonable price. The SEDEX Model 100LT can be connected to any HPLC or SFC system, and you can control the detector locally or via a PC for a fully integrated system using a broad range of SEDEX drivers. A remote shut down mode is also provided to minimize cost and enhance system lifetime. Full SOP protocols are provided for GLP compliance and valuation procedures. New generation design for low-temperature evaporation of the mobile phase: optimises sensitivity of thermally labile and semi-volatile compounds. Enhanced sensitivity using digital signal treatment: an innovative signal processing algorithm minimises noise and optimises sensitivity. Direct linearity of the global dynamic range: enhanced correlation coefficients. Minimised band broadening due to an innovative cell design and a wide choice of nebulisers. Four nebulisers are available to optimise your applications. Nebulisers cover a wind flow rate range from few uL/min to several mL/min, in addition there is a nebuliser optimised for U-HPLC and a nebuliser specifically optimised for SFC. These nebulisers can be easily changed to meet the specific requirements of the application. In addition, all parts of SEDEX Model 100LT are designed to provide the lowest dispersion, so that the observed peak widths are similar to those obtained with the most advanced UV/Vis detectors (typically below 1 second in U-HPLC). The eluent from the column is mixed with an inert gas and goes through the narrow orifice of a nebulizer to generate a homogeneous mist. This fine mist is composed of droplets of mobile phase containing the eluting compound of interest. SEDEX LT technology allows the selection of droplets as a function of their size in order to prevent larger droplets from entering the evaporation (drift) tube. Large droplets would require higher temperatures to be dried, resulting in increased background noise. This selection of droplets by size enables detection using a very low evaporation temperature, with resulting low baseline noise and excellent sensitivity to solutes, including semi-volatile solutes. The nebulized eluent goes through a heated tube to evaporate the mobile phase. The stream of solid particles enters a flow cell which includes a light source and a photomultiplier or a photodiode. The intensity of the light scattered by the particles is directly related to the mass of the eluted compound. The solute molecules from the mist, assisted by GSFTM, go through an optical head designed to measure the scattered light. GSFTM involves the addition of gas to focus the solute particles within the optical head for enhanced detection and safety. 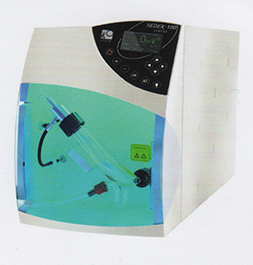 In an ELSD, the nebulized eluent is evaporated by going through a heated tube. The temperature of this tube is undoubtedly the most critical parameter when optimizing detection. If the temperature is too high, semi-volatile or thermally labile compounds in the sample may evaporate or decompose and will not be detected. Most of our competitors� ELSD systems do not select droplets and require higher temperatures to reach acceptable levels of noise during the analysis, resulting in much lower sensitivities for semi-volatile and thermo-labile compounds. All SEDERE detectors feature low-temperature operation to ensure that excellent sensitivity is provided even for semi-volatile or thermally labile compounds. These detectors can be used with conventional analytical and preparative Liquid Chromatography, as well as with U-HPLC, HTLC, ì-HPLC, GPC, Flash Chromatography, CCC, and SFC. LT-ELSD stands for Low-Temperature Evaporative Light-Scattering Detection. It is a nearly-Universal and powerful detection mode for Liquid Chromatography and Supercritical Fluid Chromatography. LT-ELSD is used as a valuable alternative to Refractive Index (which is limited by exclusive isocratic separations) and UV/Vis detection (for the latter particularly when analytes do not possess any chromophore) and is also considered as relevant complementary equipment to LC/MS. 2. When is LT-ELSD used? LT-ELSD provides a response under isocratic or gradient chromatography conditions independent of a compound absorbance, fluorescence or electro-activity. LT-ELSD can be used to analyze all solutes less volatile than the mobile phase. With SEDEX detectors, semi-volatile and thermo-labile solutes can be analyzed with high sensitivities due to the Low-Temperature evaporation technology (patented). 3. What are the different applications of SEDEX Detectors? SEDEX detectors can be used in different areas: conventional HPLC, U-HPLC, HTLC, µ-HPLC, GPC, Preparative HPLC, Flash Chromatography, Counter Current Chromatography and Supercritical Fluid Chromatography. Elsewhere, SEDEX detectors can be connected to any Chromatography system via A/D converters or directly using RS-232 or USB with our latest models. To shift from an application to another (e.g. HPLC to U-HPLC) just replace the nebulizer of the detector by the correct one. Nebulizer replacement is very easy and can be done in less than 2 minutes. 4. How does LT-ELSD work? In LT-ELSD, the mobile phase enters the detector, is nebulized with a clean gas and then evaporated in a drift tube; the remaining solute particles are finally detected by the way they scatter an incident light beam. The intensity of the light scattered from suspended particles depends on their size which depends itself on the size of the droplets generated by the nebulizer and the concentration of solute in the droplets. The droplet size produced by the nebulizer depends on the physical properties of the liquid and the relative velocity of the gas and liquid stream. The importance of all these parameters emphasizes the need for careful design and rigorous optimization of the different parts of SEDEX detectors. 5. What is the 3-step principle of SEDEX Detectors? Three important steps located in three different parts can be defined during the LT-ELSD process: Nebulization, Evaporation and Detection. This first step transforms the whole liquid phase flowing from the LC column into fine droplets. The smaller the droplet size, the lower the temperature needed to evaporate the liquid phase. With SEDEX detectors, the nebulizer and the nebulization glass chamber are designed to eliminate the biggest droplets of the solvent. This second step begins when the droplets are carried by the gas flow into the evaporation tube. SEDEX detector drift tubes have been designed to optimize the efficiency of the required evaporation with the lowest temperatures. The solvent is completely removed to produce particles of solutes. Practically, a temperature in the range 30°-60°C is sufficient to evaporate most of the solvents used in HPLC. Analyte particles pass through a detection chamber where they are hit with an incident light beam. The amount of light scattered by the particles is measured using a photomultiplier tube or a photodiode and an electronic device. In SEDEX detectors a secondary gas inlet is used to concentrate the particles in the centre of the detection chamber to further increase sensitivity and to prevent this part from any contamination. 6. What are the compounds suitable for LT-ELSD? Basically, all compounds less volatile than the mobile phase are suitable for LT-ELSD. The boiling point is often used as an indication of compound volatility but it is sometimes misleading. A better indication of the volatility of a compound and hence LT-ELSD suitability is vapour pressure or latent heat of vaporization. 7. What are the mobile phases suitable for LT-ELSD? Most HPLC grade solvents are suitable for LT-ELSD. To get the lowest background signal, the main parameter to check is the Residue After Evaporation (RAE) which should be preferably below 1ppm. LC/MS grade solvents have very low RAE and provide excellent mobile phases for LT-ELSD. Since the mobile phase is evaporated before detection, any gradient system can be performed with absolutely no effect on the baseline when the solvents have got similar RAE levels. A broad range of volatile additives can be used with LT-ELSD. Among these: acids (formic acid, acetic acid, trifluoroacetic acid...), bases (ammonia, triethylamine...), buffers (ammonium formate, ammonium acetate, ammonium carbonate...), ion-pair reagents (pentafluoropropionic acid, heptafluororobutyric acid...), these compounds can conveniently modify the mobile phase to separate complex samples. Non-volatile additives (such as sodium or potassium phosphates or sulphates) are not compatible with LT-ELSD and should not be used. Indeed, they may contaminate and even drastically damage some parts of the detectors. However, these additives can be easily replaced by corresponding volatile ones. 8. What is the gas suitable for LT-ELSD? LT-ELSD can work either with air or nitrogen. However, for safety reason SEDERE strongly recommends using nitrogen. Indeed, mixing air (containing oxygen) with combustible solvents creates highly inflammable and possible explosive mixtures. Gas may come from laboratory lines or gas cylinders and typical consumption is less than 3L/min. The gas does not require a high purity but it should be free of oil and particles. The standard operating pressure is 3.5bar (51psi), except for SEDEX FP (2.0bar, 29 psi). For better performances, SEDERE recommends using at least a gas regulator with filter (0.01µm) and manometer. 9. What is the sensitivity of SEDEX Detectors? For the majority of the solutes, the detection limits obtained with the latest SEDEX detector models frequently reach the very low nanogram (even the mid picogram levels with SEDEX 90LT) on the column. For increased sensitivities, it is recommended to use lower internal diameter columns with lower solvent flow rates. 10. What typical RSD% values can be reached with SEDEX Detectors? If physical conditions of the analysis are maintained constant (sample volume, composition and quality of the mobile phase, flow rate, gas pressure and temperature of the detector), the reproducibility of the SEDEX detectors is quite good and reach typical Relative Standard Deviation values of the signal below 2%. Moreover, to further improve between-day RSD%, an internal standard can also be included in the samples. 11. Can SEDEX Detectors be used in U-HPLC? SEDEX 85LT and SEDEX 90LT are fully compatible with Ultra-High Performance Liquid Chromatography using sub-two micron particle column. Indeed, SEDEX 85LT and 90LT have been designed and optimized to provide the highest efficiencies with peak widths below 1 second and analog data rate of 100Hz. 12. Can LT-ELSD be used for quantitative analysis? Yes. LT-ELSD is a mass sensitive detection. Using the same measurement conditions will provide the same signal intensity for the same concentration. Most of evaporative light-scattering detectors have limited direct linearity, within one or sometimes two orders of magnitude, with correlation coefficients over 0.99. However, this could be quite satisfactory for the majority of QC analyses, particularly when the concentration range for quantitation is limited to 60% and 140% of the target value. When larger ranges of concentration are required evaporative light-scattering detection generally provides a sigmoid, logarithmic or quadratic response depending on the application, but most of the HPLC software allow the users to easily select the equation which will directly provide the best correlation with the detector response. Otherwise, the standard log-log transformation can be used. Due to an innovative and efficient optical head design, our latest Model SEDEX 90LT drastically increased the overall direct linearity range with typical correlation coefficients over 0.995. 13. What are the most important points to better use SEDEX Detectors? The most important part of SEDEX detectors to take care is the nebulizer. It should be kept in a good condition. Just a simple preventive maintenance is necessary to preserve its performance and extend its lifetime. Make sure that the siphon of the nebulizer glass chamber is always filled and the liquid level is stable and equal at both sides. Make sure that the drain and exhaust tubes are correctly installed and the extraction of the exhaust device is not too strong. Elsewhere, other particular considerations should be brought to the mobile phase (low RAE), to the gas (clean and with a stable pressure), to the column quality (no phase "bleeding") and to the HPLC equipment which should be in a good working condition. 14. What is the most important parameter to set with SEDEX Detectors? Evaporation temperature is the most important parameter for LT-ELSD. For non-volatile compounds, select a high evaporation temperature (e.g. 50°-60°C) to completely evaporate the mobile phase, thus minimizing the baseline noise and obtain the highest sensitivities (highest S/N ratios). Elsewhere, the outstanding and unrivalled advantage of the Low-Temperature Technology of SEDEX detectors enables the highest sensitivities for semi-volatile and thermo-labile compounds. Indeed, just setting the temperature in the range of 30°-40°C also provides the highest signals for these compounds without compromising the evaporation of the mobile phase. 15. Can SEDEX Detectors be controlled externally? The latest SEDEX models have got the RS-232 or USB connection feature and can be controlled by chromatography software. Drivers are available for OpenLAB (both ChemStation and EZChrom editions), ChemStation, EZChrom Elite, Chromeleon, Xcalibur and Clarity. 16. What are the main considerations when using SEDEX Detectors with other detectors? SEDEX detectors need to be the last detector when connected in series with UV or RI detectors. Alternatively, SEDEX detectors can be connected in parallel with MS detector by means of a flow splitter. In any case, check that all connections from the column are properly done to avoid any extra dispersion.